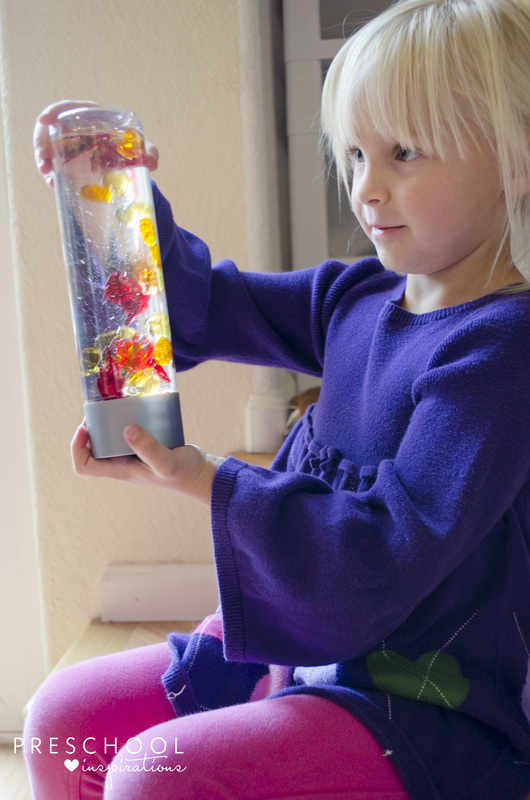 Make a beautiful fall discovery bottle with just a few ingredients! 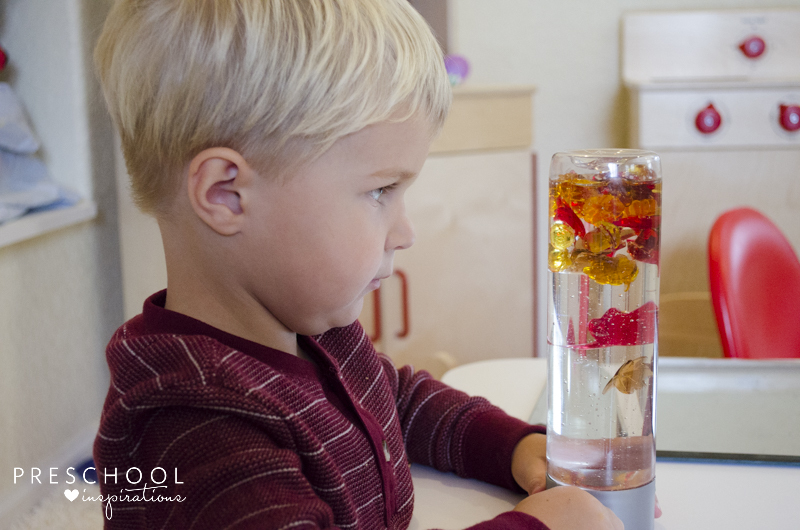 Discovery bottles, also known as sensory bottles, are well-loved in my classroom and with my kids. We made one with the fall table scatter, and it is irresistible. We held them up to our windows, and it was even more magnificent. There are pumpkins, red leaves, brown leaves, and yellow acorns. These were all from Target, but they are also sold at craft stores and select dollar stores. I would definitely call around first before going on a goose hunt finding them. If you can’t get them at a store, Amazon also has some to choose from (but not quite as affordable). You might have noticed that we use this with a mirror. It’s one of the ways that we reflect light through play. These would work great with a light table too, but mirrors are perfect if you don’t have one or if you already have a lot of natural light in the room like we do. 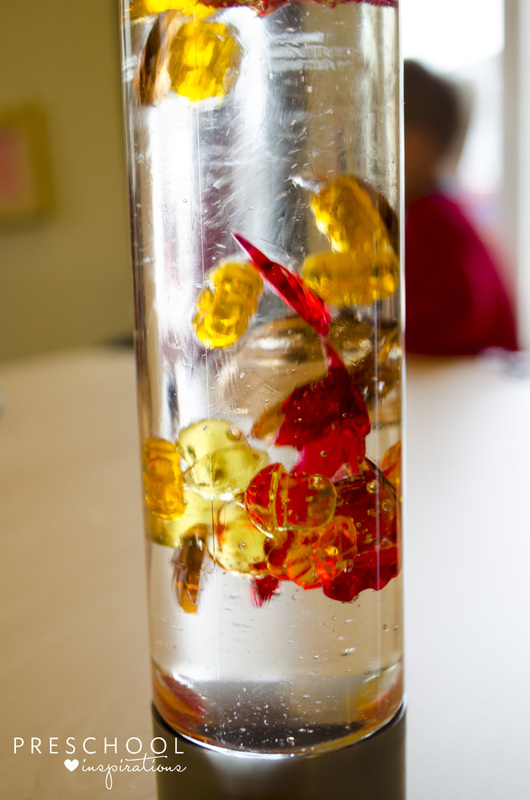 Here is how we made our fall sensory bottle. A clean, empty water bottle. I recommend one that is sturdy with a wide lid such as VOSS since this is extra heavy for a sensory bottle. However, any bottle would work. Clear(ish) colored corn syrup or clear Elmer’s glue. Table Scatter also known as acrylics or gems. Hot Water (optional, or just a teeny, tiny bit). Super glue or hot glue to secure the lid. I usually get my VOSS water bottles online. I just grab a dozen at a time and use them throughout the year. They are also at some grocery stores, Target, gas stations, or even places like TJ Maxx. Corn syrup can be found at the grocery. Another option is some clear Elmer’s glue. I used to get table scatter at places like dollar stores, Target, or craft stores (Hobby Lobby, Michael’s, Joann’s). But recently they are really hard to find in stores. So call ahead if you plan on making a trip. Otherwise, I would just grab some on Amazon. 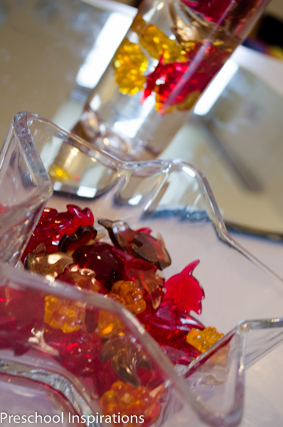 You can read all about my tips for making a perfect sensory bottle if this is a new activity for you. There are lots of troubleshooting tips and suggestions of where to buy different bottles. First, put the table scatter into the bottle. Next, add the corn syrup or glycerine. I put in a slight amount of water, but I think the flow would have been slower if I had used only corn syrup. So that’s up to you whether or not you want to use water. Keep in mind that you want some space at the top so the liquid can go up and down easily. If you are using Elmer’s clear glue, start by putting it 1/3 full of glue and adding some water. Then keep adding more and more. I write more about how I use Elmer’s glue in a sensory bottle over in my post about how to make a calm down bottle. The ratio I used for my own fall discovery bottle was about 95% corn syrup and 5% water. It took about 5 seconds to go from one end to the other. Once your bottle is the way you like it, it’s time to glue the lid on. Initially, your fall discovery bottle will look “streaky” as the corn syrup settles. It can take a few hours to fully blend. I personally like the streaky swirls in the meantime! These are so fun to watch for kiddos and adults! They are perfect for any age group, from babies on up. Just be sure to glue the lid on! You don’t want that sticky mess on the floor. If you need ideas of what to do with the rest of your awesome table scatter, here is how we use them in math activities. 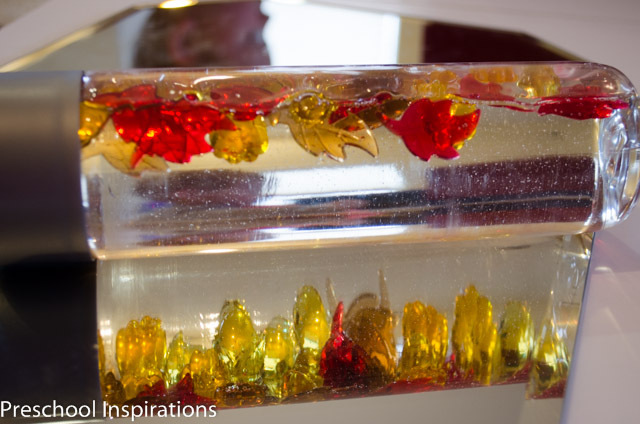 To see more great fall ideas, feel free to look through my fall pinterest board. I LOVE this! I’m definitely going to make this for my daughter. And the mirror is a nice enrichment piece. You are so sweet, Tiffiny! I hope you and your daughter have a blast. It’s so mesmerizing!! I love the voss water bottles but the lids of mine broke immediately. The kids dropped them and they cracked and broke apart. Did this happen with anyone else? Any suggestions on what else to use? Hi Angharad! You are definitely not alone. They do break from time to time :(. I find that the smaller Voss bottles hold up better because they don’t get so heavy. Or there are people who have recycled jars that wouldn’t do this such as empty peanut butter or mayonnaise jars. I love this idea! I made a sensory bottle with the glitter before. This is a great idea for the fall! I used to be a teacher too, now I’m SAHM and preschoolers in my class used to LOVE stuff like this! Aren’t sensory bottles the best!?! My own kids love them too :). This is an awesome idea. 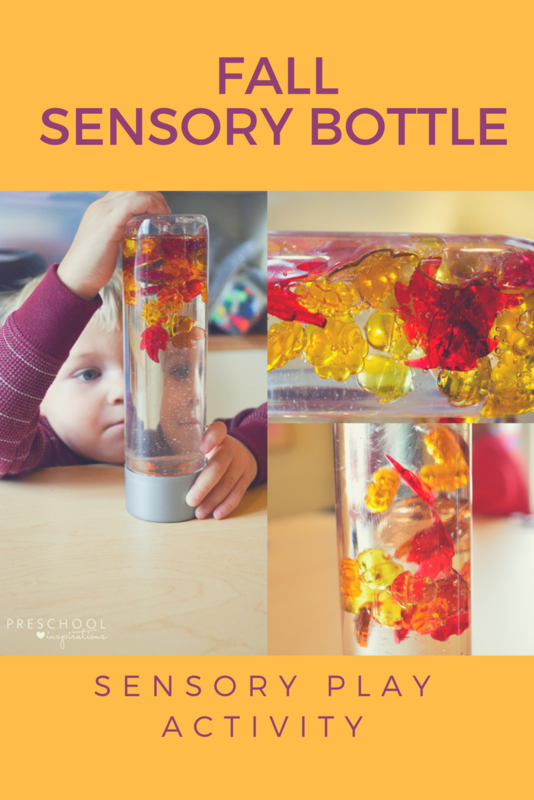 The preschools will love this fall sensory bottle! Great idea! 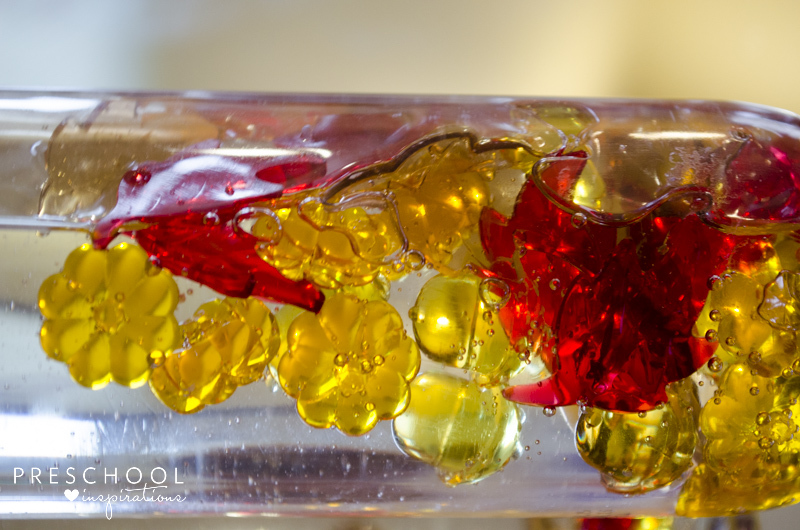 Does the corn syrup spoil over time? Thanks! Hi Janna, Sometimes it gets moldy and sometimes it doesn’t. I try to make sure to use a super clean bottle to prevent it, but sometimes it does happen. I love this idea for fall time! It would be super cool to have a bottle for each season. Thanks for being so detailed with your instructions! I’ve never used corn syrup before, thanks for the tip!